Long Ad Titles (LAT) is a feature that displays longer ad titles to attract the user's attention, thus boosting CTR. 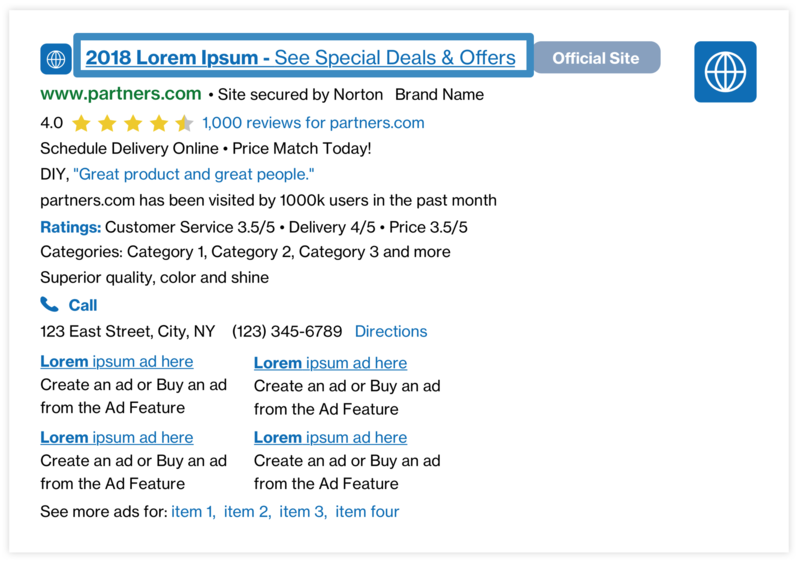 Long Ad Titles will add the domain name or part of the description to the original ad title. Long Ad Titles can be up to 62 characters long, while original ad titles can only be up to 25 characters. If the page is a traditional SERP, this feature will only show on the top 4 search ads to create differentiation. Long Ad Titles will not show in the east rail due to limited space. If an ad includes an Official Site Badge, it will not be able to include a Long Ad Title due to space constraints. Results: Some Partners have seen an estimated lift of +5-7% CTR. Results may vary. Parameter: "&longAdsTitle=1" (case sensitive).To call for both long ad titles and original ad titles, use "&longAdsTitle=2".